More and more homeowners are seeking to achieve their dream home, but according to a recent Houzz survey, very few have achieved their vision. For many, their home is a work in progress. Remodeling spending has been strong the past two years and to achieve their dream house, 36 percent of Houzz respondents are looking to refresh existing décor, 44 percent want a complete overhaul of the home and 20 percent want to build a completely new home. Our recent clients, Ellen and Andrew, were among the group of homeowners that love their home and property but wanted to make some modern updates. 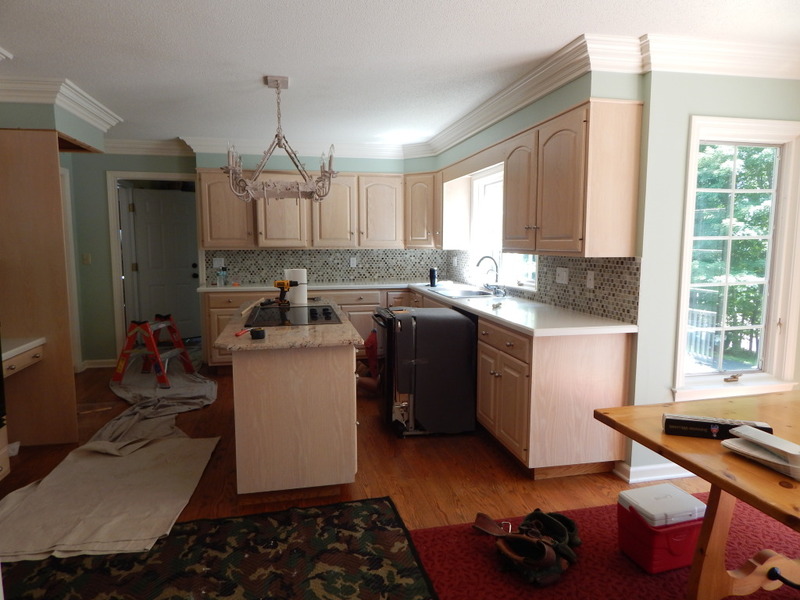 They hadn’t updated the major rooms in their home in many years, and were ready for a complete overhaul in several key spaces and enlisted our help. The kitchen in particular was in excellent condition but somewhat dated and reminiscent of the 1990s. 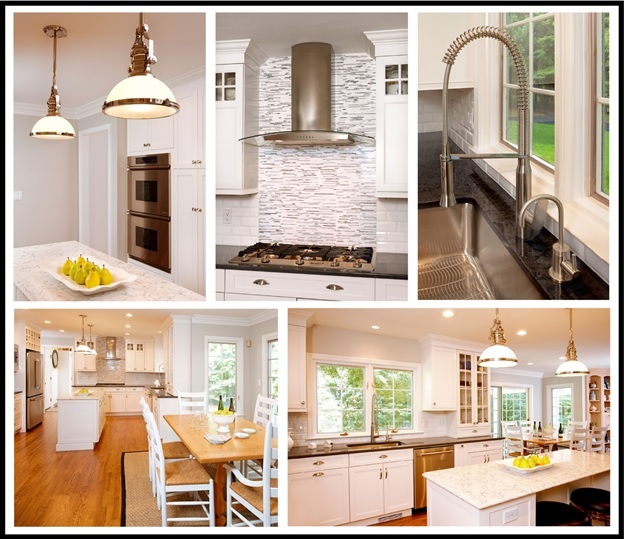 Working with our client’s vision for their “dream” kitchen, we completely transformed the space from start to finish. The final reveal, pictured below, features classic custom shaker style cabinetry paired with modern elements throughout to give this kitchen an upscale, sophisticated look. Balancing modern and transitional kitchen décor trends including Quartz countertops, industrial pendant lighting, and simple shaker style cabinetry were important elements to incorporate into this custom kitchen to ultimately achieve the homeowner’s vision for their ideal space. Bright White Custom Cabinetry. 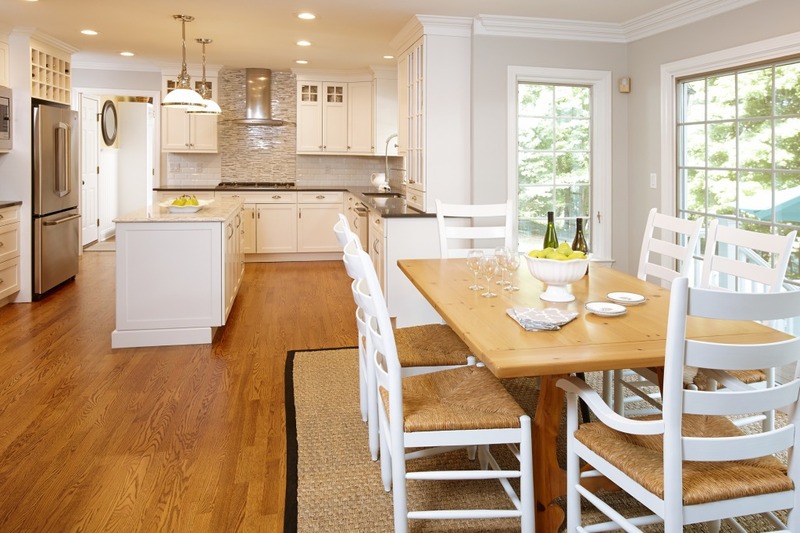 White continues to be the overwhelming choice for kitchens and these custom Shaker style cabinets feature clean lines and sophisticated style that are timeless. Industrial Pendant Lighting. Lighting selections are a critical part of any space — but most important in the kitchen. By adding these two pendant lights over the marble looking quartz island we created a twist of contemporary style with sophisticated appeal. Quartz Countertops. Granite has ruled supreme in recent years but trend setting quartz countertops offer a variety of colors and styles that provide both a custom appeal along with durability. Faucet. We selected a high end industrial style, single lever faucet that balances modern styling and design with the hard working functionality a kitchen faucet demands. Tile Backsplash. These custom subway tiles offer a classic appeal but have a beveled edge that adds extra style. The custom, natural stone tile behind the stove and floating hood, provides the kitchen’s focal point and our client’ favorite element of their new kitchen!